Somewhat lengthy quote of W. Paul Jones in his book “Theological Worlds: Understanding the Alternative Rhythms of Christian Belief.” They are quoted backwards, in that the first two paragraphs are from page 14 while the third paragraph is from page 11. “Tillich distills these conclusions to which the past centuries have brought us by insisting that human beings are uniquely characterized by the inability to exist without meaning. We are freaks, for while life all around us does unquestioningly what it seems structured to do, humans cannot quiet the question, Why? Such self-consciousness brings forth deep needs— to be meaningful, to be significant, to belong. These needs are not optional but appear to be essential to human existence as such. …..
Peter Berger once observed that while dogs have an instinct for being dogs, humans alone are born into an unfinished world, one they must endeavor to complete in order to be able to call themselves human. Whatever functions as one’s ultimate concern in this endeavor provides the content designatable as one’s God. Such an understanding makes common cause with Augustine’s insistence that by nature, each person must love. The theological issue is not if, but who or what functions as one’s ultimate love. We are restless, and thus religious, for we are never satisfied with the apparent, or tamed by the known limits. Rather, like a spider trapped in a bottle, we push at the boundaries of life and death, puzzle over strategies of good and evil, while dropping from a string hung daringly over the edges of mystery. The religious in each of us is an impulse to journey, to quest, to seek— for self-identity, belonging, legitimacy, meaning. And in the end, it is a hope worth believing that the impulse within has its counterpart in a luring that is Without. In other words, our seemingly built-in desire for meaning— seeking to find god(s)— may actually be evidence of a God who is seeking to be found. “In the richer Gulf countries the grunt work is done by foreigners. Sometimes 80 percent of the labor force comes from outside. The Philippine economy is set up to facilitate overseas employment. Without enough jobs at home, there is a push to work in richer countries and send back foreign exchange. Many Filipino university graduates take jobs as maids or nannies if they are women, or as construction workers if they are men. In the homes where they work they risk sexual abuse. On job sites they risk injuries. Legal protection is rare, and medical help for foreign labor is unreliable. Meanwhile, back in the Philippines they have left their parents and brothers and sisters, and often wives and husbands and children too. Witness to local Muslims is illegal, and in countries like Saudi Arabia even Christian worship is banned. Yet many Filipinos have grown in their faith in this hard setting. For some nominal Christians it has been a wake-up call. They are stressed. They are spiritually starving. To help them, multilevel discipleship training programs have been developed on the spot. Others came prepared to witness in spite of the risk. Back home there are at least ten Philippine agencies that provide mission training for workers going abroad. On the field such laborers share their faith with office mates or house mates who show interest. And they sing. Whenever there is a lull, a Filipino sings. If he or she is a believer, Christian lyrics bubble up. -Miriam Adeney in “Kingdom Without Borders” chapter 1. Pathways” by Gary Thomas. In some ways, it has a feel like “A Generous Orthodoxy” by Brian McLaren (although less controversial in its style, and perhaps its intent) in that both seek to broaden the perspective of Christians in what may be acceptable and pleasing to God and/or valuable to us. Sometime in the late 1970s and early 1980s, the ‘quiet time’ became a staple of most discipleship and church training programs. Usually consisting of thirty to sixty minutes, the quiet time was most commonly composed of a short period of personal worship, followed by some intercessory prayer (using a prayer notebook or intercessory prayer list), Bible study (according to a set method) and then a concluding prayer, followed by a commitment to share what we learned with at least one other person that day. This is something that’s easily taught and, for some circles, easy to hold people accountable to: ‘How many times this past week have you had your quiet time?’ Anything less than seven was a wrong answer. -Sacred Pathways, Zondervan 2010 edition, p. 14. With perhaps good intentions (who would oppose regular personal worship, prayer, and Bible study? ), we reduced the devotional life to rote exercise. A. W. Tozer warned us about this: ‘The whole transaction of religious conversion has been made mechanical and spiritless. 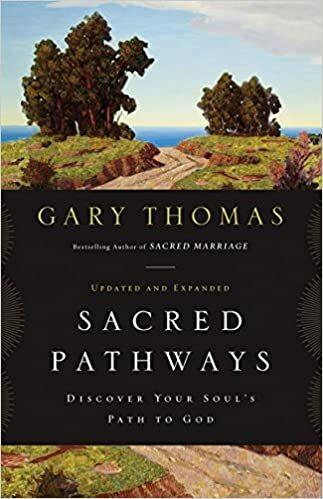 We have almost forgotten that God is a person and, as such, can be cultivated as any person can.’ -Sacred Pathways, p. 14-15. I have always struggled with Quiet Time. It seemed often like drudgery. I always wondered why a relationship with God should seem like drudgery. Is it supposed to? But then, being a “disciple” presumably involves “discipline,” and discipline certainly does not sound like it should be easy or fun. But there was a strange twist. I would really enjoy learning about God, studying the Bible to learn more about God. I especially found this fulfilling in the context of preparing lessons for Sunday School, Group Bible Studies, or in preaching sermons. But then I heard from several sources that this does not count. Why? It seemed as if there is the presumption that work and worship don’t go together. But maybe work and worship DO go together. It got me thinking that maybe what I find worship is different from what some other find worshipful. I guess that is why I like Gary Thomas’ book, because it doesn’t judge. One can worship God in different ways— one size does not fit all. So I need to continue the journey as I look through these nine temperaments. Two quotes. One by Edward Everett Hale, and the other by Edward Everett Horton. Both quotes are, loosely speaking about dealing with limitations. Poem by Edward Everett Hale. 1822 – 1909. Chaplain to US Senate 1903 – 1909. From “Masterpieces of Religious Verse” published by Broadman Press in 1948. Quote of Edward Everett Horton. 1886 – 1970, Comedic Actor. -Horton as Horace Hardwick in “Tophat”, 1935. I live in Philippines, a nation that many of its citizenry describe as the only Christian nation in Asia. (Of course, if “Christian nation” means majority of its citizenry describe themselves as Christian, then Armenia is also an Asian Christian nation— and Georgia, Cyprus, and Timor-Leste also qualify, depending on where one puts the artificial boundaries of Asia.) I was raised in the United States, a country that many of its citizens like to think of as a Christian Nation, or perhaps founded as a Christian Nation. I really have no interest in either perspective. … AND THAT IS OKAY. Christ should be seen in contrast to the institutions of the world. I am also reminded of the story of Abraham and Jehannot de Chevigny in The Decameron. In that story, a Jewish merchant named Abraham chose to follow Christ after visiting Rome. According to the story… he was so disturbed by the gross immorality of the leadership of the Western Church that he decided that Christianity could not have come from people, but from God. In other words, the ideals of Christianity were so high in contrast the the practices of the religious institution of Christianity, that Abraham to see Christ only in contrast to the established church. As I am writing this, it is Holy Saturday, or Black Saturday, the full day of Christ in the grave. While there are many theories as to the reason for the atonement (a dubious exercise), it is worthwhile to recall the role of institutions in Jesus’ death. The Institution of Religion charged Jesus as worthy of death. He was seen as a usurper of authority and a blasphemer. The Institution of Governance carried out the killing. While the government lacked the gusto of the religious establishment to have Jesus executed, it ultimately followed the Machiavellian process that governments almost always do– maintain the status quo to its own perpetuity. The Institution of Revolution (if one wishes to think of Revolutionary elements in such a way) appeared happy to rid itself of a disappointment. Jesus entering Jerusalem in a Messianic fashion (or at least in a Judas Maccabeus fashion), was followed by Jesus refusing to embrace political revolution. All three institutions seek (earthly) power to perpetuate and extend itself. Jesus made it clear, however, that his Kingdom (reign, institution) is not of this world. In many a Christian sermon, it is said that we are guilty of Jesus’ death because we live a life of sin. Some extend it further, noting that many (most?) of us would have joined in the execution if we were there (as angry pious religious folk, patriotic citizenry, or disenchanted revolutionaries). It could be taken further still, that our pet institutions would likely have behaved little better than did the institutions in AD30. Our institutions are driven by the same forces today that Jesus rejected, and still rejects. It is good that Jesus cannot be seen in Religion, in Government, or in Political Action. A Jesus who could be seen in them deserves to be disappointing to people who desire something more than this world offers. Jesus is seen in contrast. Jesus contrasts self-righteous religious leaders. Jesus contrasts weak-willed self-serving politicians. Jesus contrasts power-hungry revolutionaries. Jesus even contrasts his followers… a naive and cowardly lot. On Easter Sunday, Jesus reveals who He is, but on Holy Saturday, Jesus reveals who (and what) He is not. There is a quote that I like that I put on one of the other blogsites I manage– the one for our counseling center, Bukal Life Care. It is on Spiritual Disciplines, and the concern associated with two extremes (one I am calling “The Individualist” and the other, “The Activist”). They are associated with emphasis on one part of the Great Commandment over the other.